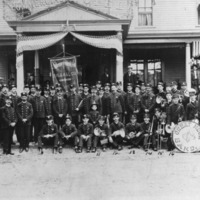 Group portrait of the Great Neck Band standing in front of the Commercial Hotel. A member in the back row is holding a banner that reads, "Vigilant Eng. & H. & L. CO. Thomaston, N.Y."
Tags: bands, Commercial Hotel, Great Neck, Great Neck band, Great Neck Vigilant Engine & Hook & Ladder Compan, group photographs, Thomaston, Vigilant Eng. & H. & L. CO.